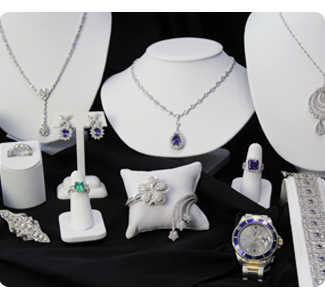 We have a wide variety of fine watches, necklaces, earrings, and other jewelry in our Tampa showroom. Since our inventory changes daily, please be sure to visit our jewelry showroom often for the newest arrivals and updates to our inventory! If you are interested in a specific piece of jewelry, please contact us. Looking to buy jewelry online? Then shop with confidence and peace of mind with our 100% satisfaction rating at our eBay Jewelry Showroom. Just as with our brick and mortar store front, you’ll find the finest selection of jewelry and watches.